Multiple sources are now reporting that U.S. Supreme Court Justice Clarence Thomas has uttered several words during oral argument. This is news because it is the first time he has spoken during an oral-argument session since February 22, 2006. Witnesses and experts immediately began to speculate as to what Thomas had said, and why it might have been funny. The words were delivered during argument in Boyer v. Louisiana, in which the Court is considering whether the state's failure to pay for a lawyer for an indigent defendant facing the death penalty undermined his right to a speedy trial. Justice Scalia asked the state's attorney whether the defendant's lawyers were qualified—in this context, clearly a softball question. 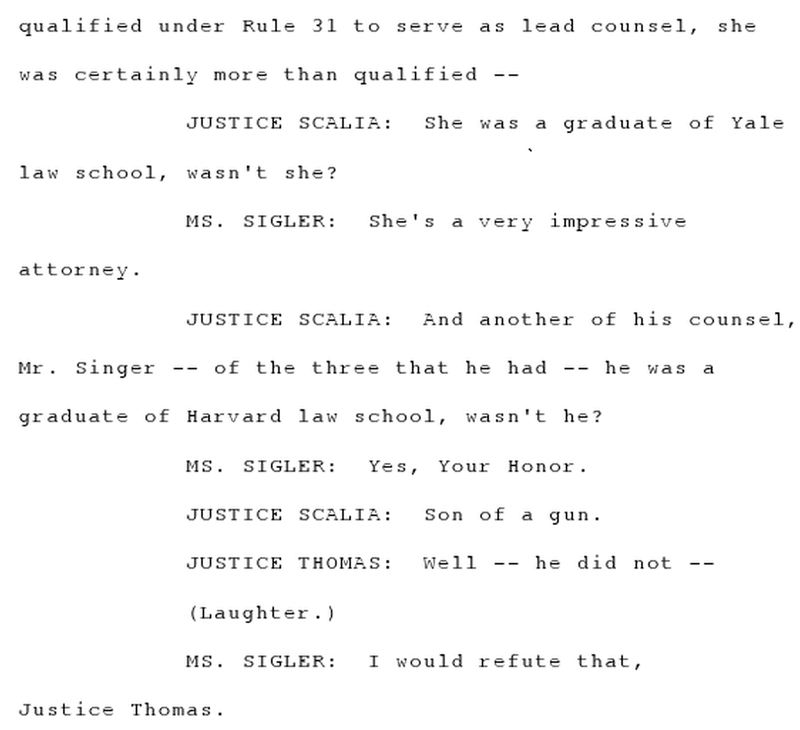 Upon being told one went to Yale and another went to Harvard, Scalia responded, "Son of a gun," obviously impressed by these facts that he already knew. According to one who was present, "Thomas might have cracked, 'That's not effective counsel.' But hard to hear." A SCOTUSblog reporter tweeted: "Thomas, J. (Yale, JD), speaks: funny at argument—Yale degree could mean lawyer is incompetent, not competent, capital trial counsel." This interpretation is consistent with the context, except for one thing: Thomas more likely wisecracked that a Harvard degree, not a Yale degree, would not necessarily establish competency—Thomas himself went to Yale, and although I believe he has criticized his own alma mater, his statement also followed a reference to Harvard, not Yale. 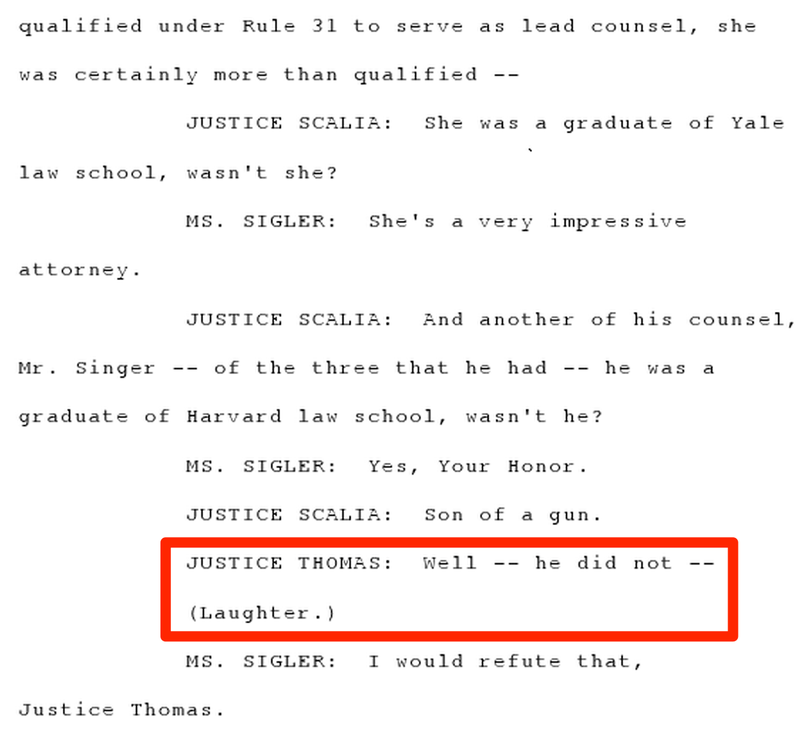 Either Thomas's comic timing is way off, or he was making a joke at Harvard's expense. By all accounts, Thomas is in fact funny, so the latter interpretation is more consistent with this evidence. Of course, it is well-known that neither Scalia nor Thomas are all that comfortable with this kind of interpretation, preferring to stick strictly to the official text. 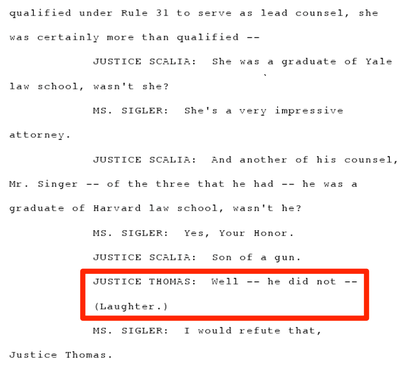 Applying that standard, then according to the only evidence we have, Justice Thomas said only "Well — he did not –", after which the audience laughed at him for being so rusty after seven years of silence. I guess we'll never know, although the recording may shed some light on the matter when it's released. Justice Sotomayor followed this with a question about whether the state defines "constitutionally adequate counsel" as "anybody who's graduated from Harvard [or] Yale"? This too was reportedly followed by laughter, but it turned out to be a "serious question." Wow, major buzz kill to return the discussion to the issue whether somebody facing the death penalty is entitled to competent counsel. But I didn't want to forget to mention that the answer to that question will be news, too.